Emotions are often as unique as people themselves. It is indeed amazing that although the human race has a set of basic emotions, it varies to a great extent from one person to another. Caused by hormones in the body, emotions can manifest as Physiological or Psychological responses. What we do and we experience at any point of time cause fluctuating intensities of emotions and Pregnancy is the perfect example of a person experiencing such intense emotions. So, what emotions are common? Who all are involved in the process? How can these be managed? Read on to find out.. Most people believe that all pregnant women are glowing and happy. The truth is that women undergo many emotional changes ranging from happiness, eagerness, anxiety, fear, anticipation and not to forget expectations. Shift in the body image, changes in hormonal levels, each woman's attitude and perception toward cultural pressures all combine to make this experience unique to every woman. Happiness and excitement are the most common emotions when you learn that you have conceived. Anxiety regarding the physical changes that's happening in your body can lead to discomfort. Many women experience nausea/vomiting during this time and it may cause discomfort and irritability. It will help to discuss about these distress with a loved one or even your doctor or counselor. 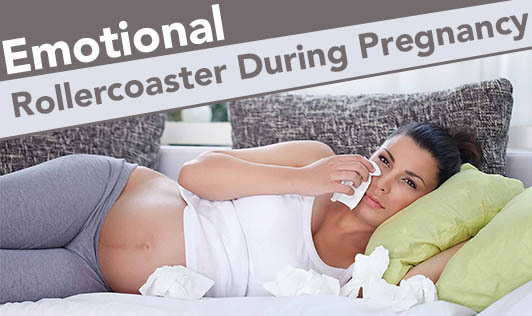 After the emotional stress and anxiety of the first trimester you can expect a lighter mood in this one. This is a time when you begin to feel increased dependence on your partner for an emotional proximity, for that re-assurance or even his mere presence will be very comforting. Talking to your partner about your fears and expressing your need for his support might alleviate your anxiety and lift your spirits. This is a time of anticipation, Looking forward for the arrival of your baby will lead to heightened feelings of excitement and you begin to feel more special with all the attention and care from loved ones. This can indeed boost your confidence. You may even experience anxiety with regard to the delivery which sets in and even intensifies as you near your due-date. Although there are no physical changes in a father-to-be, there will be a range of emotions very similar to the mother-to-be, and not many men feel comfortable expressing these. This is also a time they tend to feel left out and they might get irritated if they don't get attention from you. The key is here is to involve your partner in as many aspects of pregnancy as you can. It may be monthly visits to your doctor or classes or a time together talking about the baby, exercising together and so on. Research indicates that such involvement strengthens the bonding between the father and the baby. Pregnancy is a very fragile phase and it can be a joyous phase of your life if you can identify your emotional changes. If your anxieties increase then it's advisable to consult your Counselor to know how to manage them. Seek help whenever you feel the need and make your pregnancy an experience worth cherishing for a lifetime.